Schoolhouse lighting has a subconscious, sentimental appeal for many of us. Childhood hours spent daydreaming at school on a rainy afternoon beneath the golden glow of a pendant light are evoked with this understated style. An office, kitchen, or bath takes on a retro style expression with the addition of these fixtures. This style is incredibly practical too; providing soft, ambient light in a clean form. What Makes a Schoolhouse Style Light? Schoolhouse style lighting refers to lighting inspired by the types of lighting fixtures commonly used in public buildings in the United States, such as school houses. The schoolhouse style was widely used between the years of 1900 and 1950. Common style elements include white glass globes in varying shapes, flushmount or semi-flushmount style fixtures, and simple metal finish fittings and ceiling canopies. Originally, the white glass fixtures were ideal for large, common spaces, such as school rooms, which needed large, even amounts of ambient light. Architects of the time widely used this simple, straight-forward lighting solution. Look for it in public and commercial buildings that date from the early 20th century. 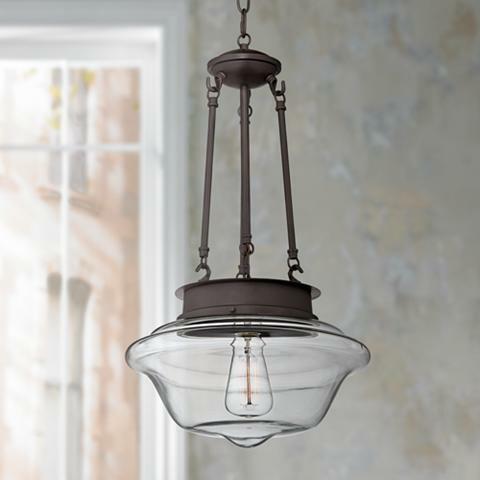 You can still find Schoolhouse style lighting today that looks exactly like the older, classic designs. Companies like Hudson Valley Lighting offer modern-day versions of the classic look. But school house lighting has also evolved and changed with the times. Newer designs have evolved from the classic milky, opaque globes to various organic shapes with bands of color and elaborate fittings. Today you will find the characteristic opaque globe coupled with fittings in every type of finish from chrome to antique bronze. A wide range of sconces, pendants, and close-to-ceiling lights have all been tailored for residential use. Browse our selection of our school house lighting from a variety of designer brands. Schoolhouse is a vintage style with historic allure, yet it is firmly rooted in the post-Bauhaus design philosophy. Invoking nostalgia with charm and simplicity is a tall order yet the schoolhouse style manages to achieve just this. The timeless schoolhouse style remains modern and relevant in today’s wide range of interiors. Our trained lighting consultants can answer any questions you may have about schoolhouse lighting. Call us at 1-800-782-1967, use our Lamps Plus contact us page, or visit a Lamps Plus store near you.